Tomorrow we present the result of four years of filming interviews and one year of putting together our documentary. 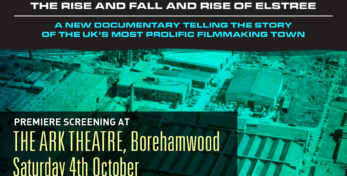 The first two public screenings of From Borehamwood to Hollywood: The Rise and Fall and Rise of Elstree are taking place at Borehamwood’s Ark Theatre at 15:00 and 20:00. The screening has been sponsored by Elstree Studios, and so the tickets are free! We really hope our first audiences enjoy the film and that it encourages more people to find out about the history of Borehamwood and Elstree’s film studios. After the first two screenings, we are screening the film at the University of Hertfordshire’s Weston Auditorium, on November 13th. This screening will be followed by a Q&A with the crew and some contributors. We hope more venues will be interested in screening the film too, and so watch this space for screening updates!